Folding electric scooters? Sure, we’ve seen those before. But what about a folding electric scooter with connectivity? Let’s introduce you to the UJET folding, connected electric scooter. The electric last-mile mobility market has a lot of players. Urb-e and Stigo are just a couple we’ve covered on CleanTechnica that have impressive features, but something they don’t have is connectivity. Perhaps you didn’t know you needed to be connected on your last stretch of commute, but the folks at Ujet think you might want to be. 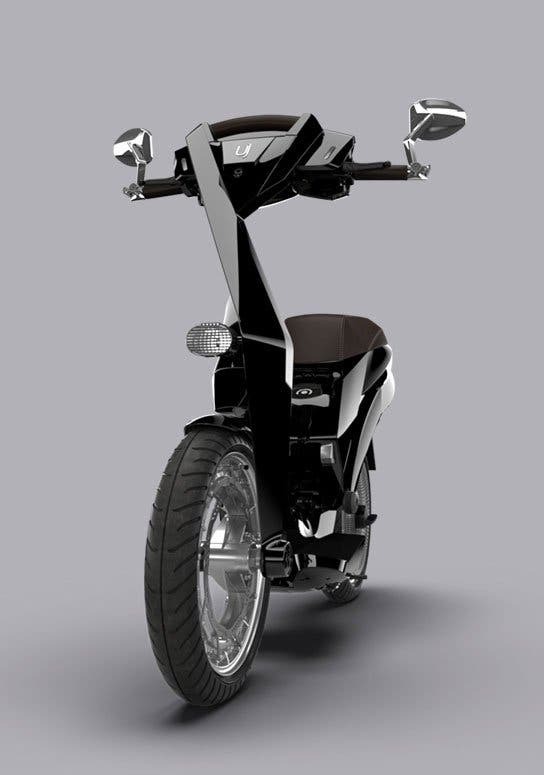 Ujet electric scooter unveiled its first electric mobility product at CES earlier this year. The folding electric scooter was designed from the ground up to include smart connectivity. The idea is to tackle city congestions and pollution with a smart urban experience. Considering that roughly 55% of the world’s population is estimated to live in urban cities and the figure is expected to climb to 60% by 2030, according to “The World’s Cities in 2016 – Data Booklet (ST/ESA/ SER.A/392),” smart electric urban mobility solutions are needed now. 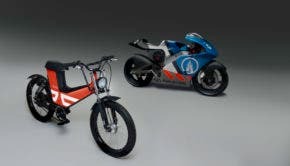 The Ujet folding electric scooter will be available with two swappable battery packs with an estimated range of up to 70 km (43 miles) or 150 km (93 miles). The batteries are cabin-type suitcase sizes that can be rolled for more convenient transport. Riders can control their Ujet electric scooter directly through their smartphones. The app allows its owner to lock and unlock the Ujet and get step-by-step directions to find where it is parked. A feature allows it to be shared with friends and family, something that can be tricky with most current mobility devices. There is a remote anti-theft protection system that sends a warning should the scooter be moved without permission. The hardware and software team up to monitor the scooter’s performance through an array of 20 sensors. 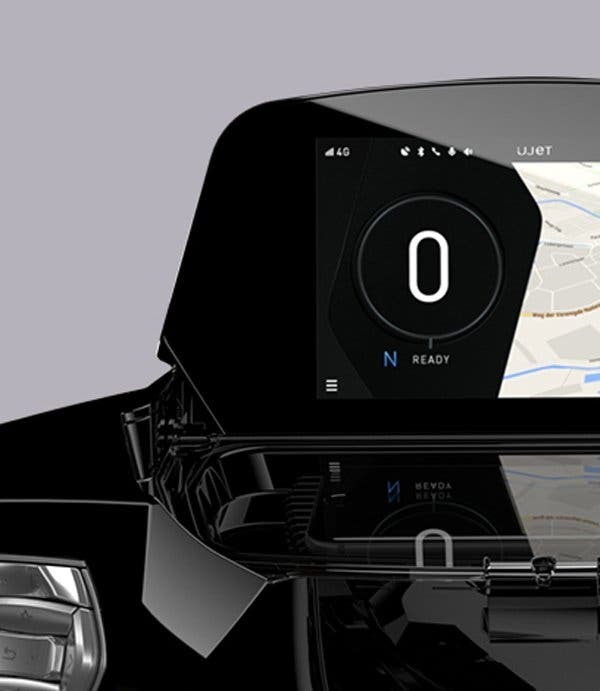 The Ujet can alert the rider of potential issues as well as monitor battery level, mileage, saved carbon dioxide emissions, and locations of the nearest service shops. It can also help you to communicate to the company’s support team. The app is voice controlled. It allows for music streaming, basic telephony functions, and can use the front-facing HD camera to take videos. We found this feature particularly intelligent since riding a two-wheeler on US roads can sometimes be a stressful experience as you mix with car drivers who can be blissfully unaware of their environment and claim no responsibility in the case of an unfortunate incident. Having a voice-activated system also allows the rider to concentrate on riding and the controls. The Ujet scooter has a SIM card with 3G connection, GPS, WiFi, and Bluetooth. The wheels definitely caught our attention. They are spoke-less orbital wheels with a suspension system. The tires are TUBALL, which uses a single-wall carbon nanotube structure that increases wet and dry handling by 2x, according to Ujet. 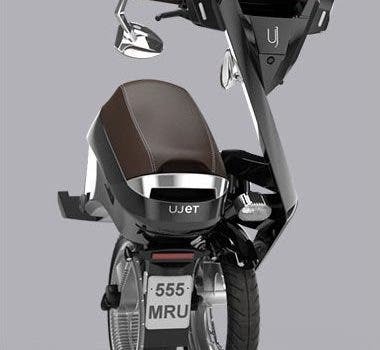 The Ujet scooter is made of alloy and carbon fiber and weighs in at a svelt 43 kg (95 lb). The in-wheel electric motor puts out 4.05 kW, with 90 Nm torque (66.38 lb ft). “Our wheel design has been drawing significant attention. 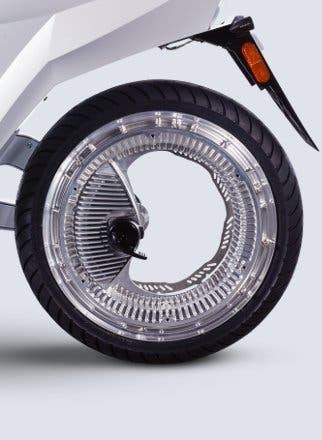 The spoke-less orbital wheel includes a suspension system and larger diameter lightweight brakes, which offers a smooth ride, and the in-wheel electric motor combines optimized size with powerful performance of 5.44 hp and 90 Nm torque, ensuring great acceleration in any conditions. The first nano-augmented wheel to ever hit the market, Ujet’s approach to tire design will make navigating a city landscape easier and safer than ever before,” Hugues Despres, CEO Ujet International, said. You might have noticed the asymmetrical design of the scooter. This was done in order to easily fold it quickly. The company already offers accessories — a helmet with a hands-free communication system with a microphone and speakers, for example, if you didn’t already feel like you were in the future. It also offers a fast charger, which can charge you up in 1½ hours if you get the small battery pack or 3 hours with the large one. The company also offers leather gloves. The Ujet is being launched in Europe in the first half of 2018. Later in the year, starting with California and Florida, it is hitting US shores, followed soon after by Asia. And now, for the moment we’re all waiting for … the price. The targeted price is $8,900 for the small battery, and $9,990 for the large battery. Reservations are now open. You can follow Ujet International on Facebook, Twitter, Instagram, and YouTube.